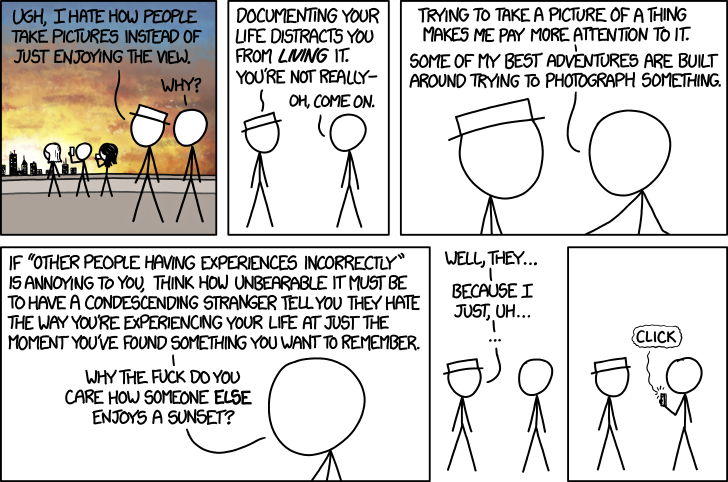 When I saw this XKCD from today I thought about a lot of the challenges to getting the image "right" and what that definition of correct may be. In the field of astrophotography, the color balance is largely subjective and exhibit considerable bias. It also reminded me of a scene when visiting Turkey where a fellow traveler grumbled about how some people considered themselves to be worthy of standing in front of a spectacular view. Bias is everywhere. It's in the filters of our minds, culture, and in the choice of what layers we try to remove in the effort to create something "unbiased." This was a challenge when I was in school and looking at ways to justify the critical perspective upon which to place any review of media. As the comic suggests, sometimes the recognition of any filter is necessary lest we get stuck in the loop of what's the proper view.